4 Croissants made with French churned butter. Made with velvety French butter for deliciously soft and light, flaky layers. 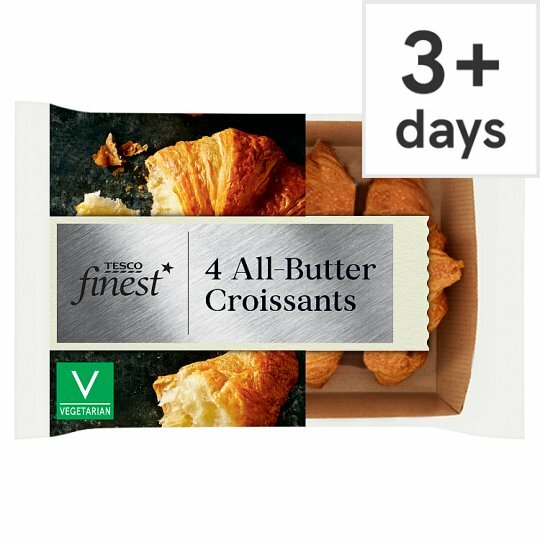 Our Tesco finest croissants are made by layering and folding the croissant dough with creamy French butter to create lots of light, flaky layers. They’re shaped, glazed with egg and then baked to create a golden finish. INGREDIENTS: Wheat Flour (Wheat Flour, Calcium Carbonate, Iron, Niacin, Thiamin), Butter (Milk) (28%), Water, Sugar, Pasteurised Egg, Yeast, Salt, Dried Skimmed Milk, Flour Treatment Agent (Ascorbic Acid). Instructions: 180°C, Fan 160°C, Gas 4 4-5 mins. Place on a baking tray in the centre of a pre-heated oven for 4-5 minutes. Instructions: 180°C, Fan 160°C, Gas 4 5-6 mins. Place on a baking tray in the centre of a pre-heated oven for 5-6 minutes.